Thank you to Walt Disney Studios for providing me with product in exchange for my review. All thoughts are my own. This post may contain affiliate links. When I was growing up, my sister and I loved watching Disney movies (still do, in fact). Disney has been delighting young viewers and families for decades. We're proud to be a Disney family, and I have loved passing on a love for the classic Disney films to my kids. 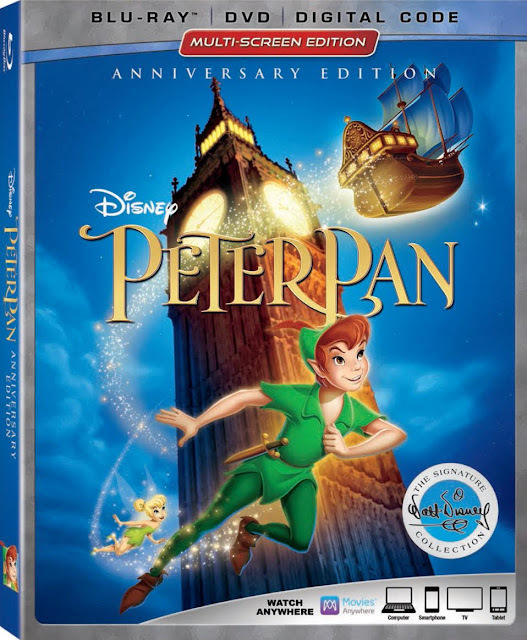 One of our all-time favorite Disney movies is none other than Peter Pan, and we're taking part in a pretty momentous celebration, as Disney releases the 65th Anniversary edition of the beloved classic, Peter Pan. 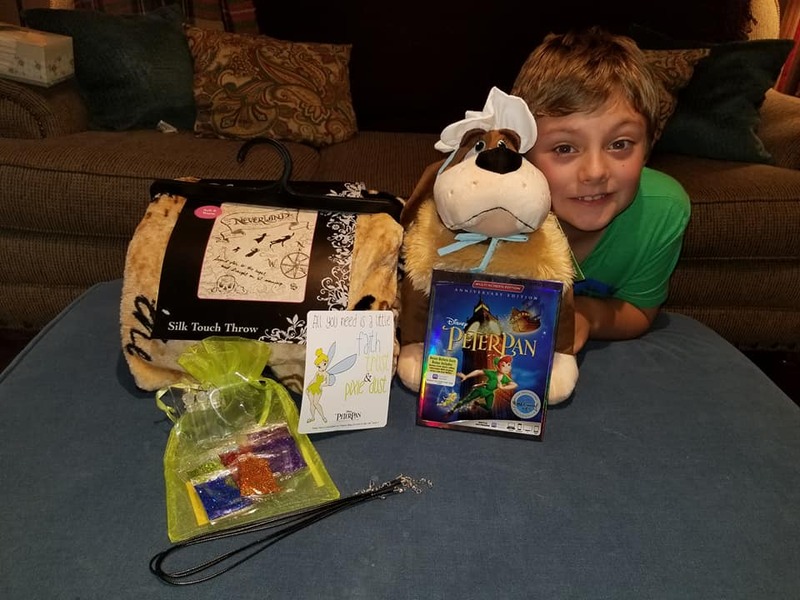 B checks out some of our celebratory Peter Pan goodies, including a plush Nana, a Peter Pan Neverland Map Throw Blanket, a DIY Pixie Dust Necklace Kit, and of course- our very own copy of Peter Pan (Anniversary Edition) on BluRay - DVD - DIGITAL. 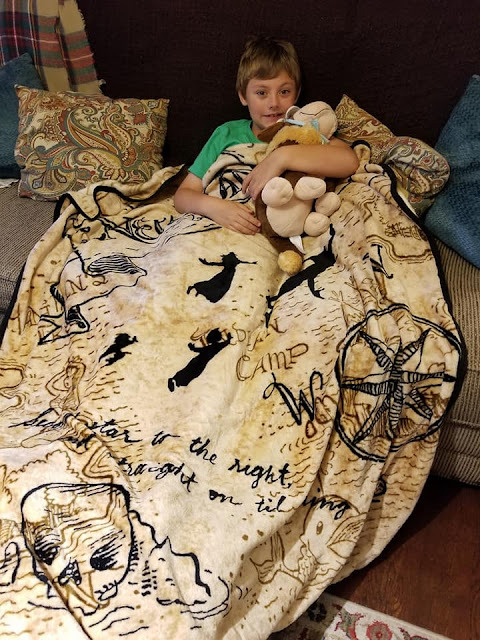 Ready to enjoy a fun movie night at home with Nana, cuddled under our new Peter Pan throw blanket. We absolutely love Peter Pan. It's one of the classic Disney movies that my son watches over and over again at his great-grandparents' house- and their copy is on VHS! We have enjoyed coming together as a family for movie night to celebrate the 65th anniversary of this special film. It's such a neat thing to sit with your kids and hear them singing the songs you sang growing up. The bonus features are amazing. We loved all of the extra footage, special stories and the behind the scenes glimpses into the life of the amazing Walt Disney, himself. Grab your copy of Peter Pan on BluRay/DVD on June 5th! Peter Pan is available now on Digital. Look for it in the MBP Summer Fun Guide. For over 90 years, The Walt Disney Studios has been the foundation on which The Walt Disney Company was built. Today, the Studio brings quality movies, music and stage play to consumers throughout the world. Feature films are released under the following banners: Disney, including Walt Disney Animation Studios and Pixar Animation Studios; Disneynature; Marvel Studios; Lucasfilm; and Touchstone Pictures. The Disney Music Group encompasses the Walt Disney Records and Hollywood Records labels, as well as Disney Music Publishing. The Disney Theatrical Group produces and licenses live events, including Disney on Broadway, Disney On Ice and Disney Live! Movies Anywhere simplify and enhances the digital movie collection and viewing experience by allowing consumers to access their favorite digital movies in one place when purchased or redeemed through participating digital retailers. Movies Anywhere bring together the movies from Sony Pictures, Twentieth Century Fox Film, The Walt Disney Studios (including Disney, Pixar, Marvel Studios and Lucasfilm), Universal Pictures (including DreamWorks and Illumination Entertainment) and Warner Bros. Participating digital retailers are Amazon Prime Video, FandangoNOW, Google Play, iTunes, and Vudu. Movies Anywhere offer a library of nearly 7,500 digital movies, including new releases, and will continue to expand the consumer experience as more content providers, digital retailers and platforms are added. Using the free Movies Anywhere app and website, consumers can connect their Movies Anywhere account with participating digital retailers and enjoy their favorite digital movies from the comfort of their living room and across multiple devices and platforms, including Amazon Fire devices; Android devices and Android TV; Apple TV; Chromecast; iPhone®, iPad® and iPod Touch®; Roku® devices and popular browsers. Consumers can also redeem digital codes found in eligible Blu-ray and DVD disc packages from participating studios and enjoy them through Movies Anywhere. This is so cute! I would love to watch this myself--Peter Pan is always a classic! I loved it when I was a child Disney makes timeless classics. I know my son would enjoy it. Its about a little boy who flies it is right up his alley!